This is rich. Two radicalized Muslims kill 14 people and injure several others and the media decides to attack Christians for praying. Tell that to the young woman hiding in an office who texted her father to pray. Tell that to her father who could barely read the text without breaking down. 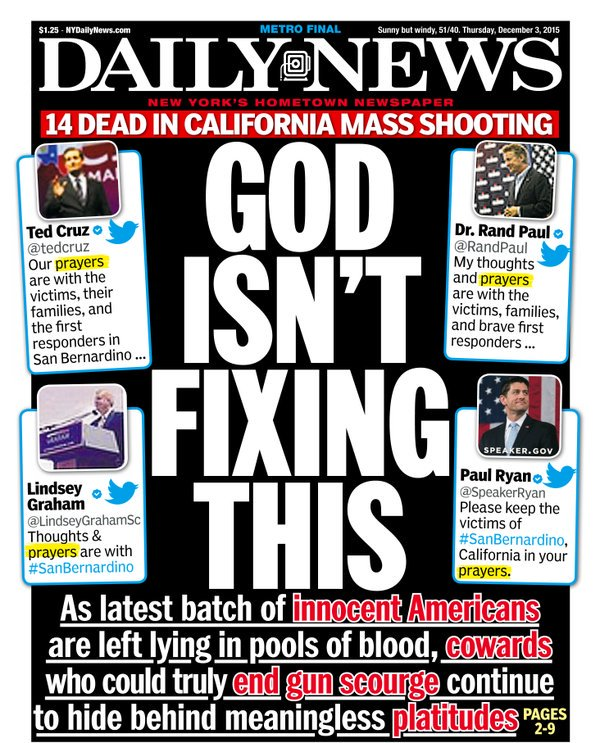 Note to Daily News: Evil is not evidence that God is powerless or does not exist. Evil is evidence that we are fallen creatures with free will and in great need of God. It's bewildering that they call it a "gun scourge" when everyone knows the real issue behind these killings. And it ain't guns. Guns didn't motivate these two to kill.